Tablets are taking off in popularity in today’s market. Even devices like the Kindle, not originally conceived as a tablet, have progressed into tablet form with the Kindle Fire and the most recent version, the Kindle Fire HDX. The HDX is offered in a 7-inch version along with the more traditional 8.9 screen size, begging comparison to one of the other small-screen tablets on the market: the Google Nexus 7 . Both devices offer 16GB versions for $229 and 32GB models for $269, while the Kindle Fire HDX also offers a 64GB model for $309. The Nexus 7 and the previous Kindle Fire HD have both gotten rave reviews from critics, but when judged against each other, which is the better buy? Both tablets use Android as their base operating system, with one slight difference. While the Nexus 7 uses the basic Android 4.3, the Kindle Fire HDX puts an Amazon-based interface over the Android OS. This new interface is dubbed Fire OS 3.0, or “Mojito,” and is intended to integrate all your Amazon Cloud purchases more easily onto the tablet. Access any of your Amazon apps, books, music, or movies with just the click of a button. On the other hand, it does make it a little bit more difficult to get to non-Amazon services or apps. You can access them with a little bit of tinkering, but it isn’t as easy as it is on the Nexus 7. The processing power of the two devices is just about equal. Though the 2.2 GHz Snapdragon 800 on the Kindle might just slightly edge out the 1.5 GHz Snapdragon S4 on the Nexus, the difference in power is not enough to be highly noticeable. Comparing their specs, we can also see that both devices have the same resolution and 2 GB of RAM. Making the choice between these two tablets isn’t going to be done just by comparing the internals. 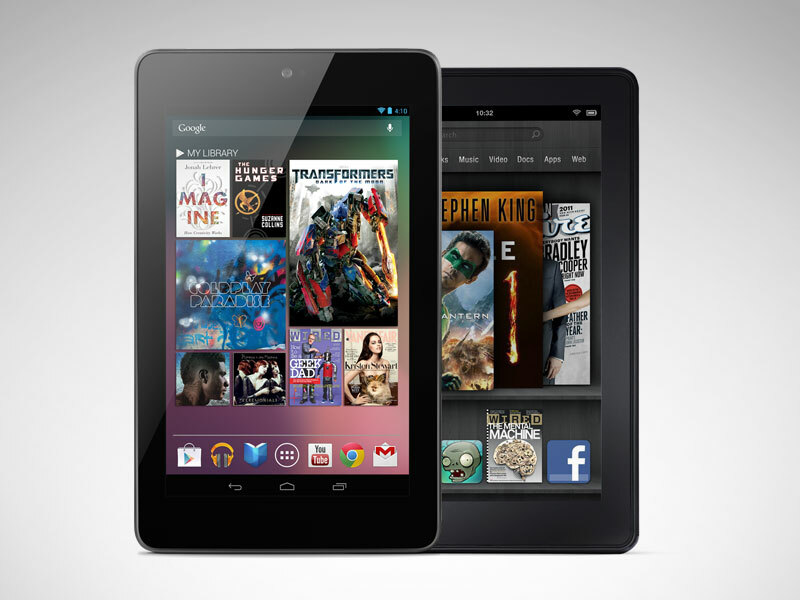 Both the Nexus 7 and the Kindle Fire HDX have IPS LCD screens with a resolution of 1920 x 1200. The Kindle Fire HDX, true to its original form as an e-reader, includes a polarizing filter to help reduce screen glare, so it is easy to read even outdoors. The two tablets both offer built-in stereo speakers, Dolby Digital Plus for the Kindle and Fraunhofer surround sound for the Nexus. Like most tablets, though, the speakers are small and can only do so much, so you’re better off purchasing some external speakers if you really want to listen to your music on the device. Battery life is a big deal for tablets, and the Kindle Fire HDX takes this one. Amazon has stated it can last for 17 hours of reading and up to 11 hours of other multimedia browsing, easily beating the Nexus, whose stated battery life was a mere 10 hours. If you use your tablet often and don’t like to charge every day, you’ll want to look at the Kindle. Nearly every electronic device these days comes with a camera, and tablets are no different. Both devices feature a front-facing camera for self-portraits or video chatting, but only the Nexus 7 has a rear-facing camera. The 7-inch version of the Kindle Fire HDX is stuck with just the one camera, although if you go with the 8.9-inch screen you’ll get two. Both devices are priced at $229 for the 16GB version. If you decide to purchase the Kindle Fire HDX, make sure to use Amazon Cyber Monday promo codes here to save on top of the already low price. The two tablets are similar enough in their build, their quality, and their features that, for the average user, there won’t be much of a difference between the two. It comes down essentially to two major issues. If you like the original Android layout and don’t want to bother with a new user interface, opt for the Nexus. If you know you need plenty of battery life, go for the Kindle. If both of these are important to you, that’s when you’ll have to make a decision. Each tablet has its own strengths and whichever one you choose is sure to do everything you’ve come to want and expect from your electronics.